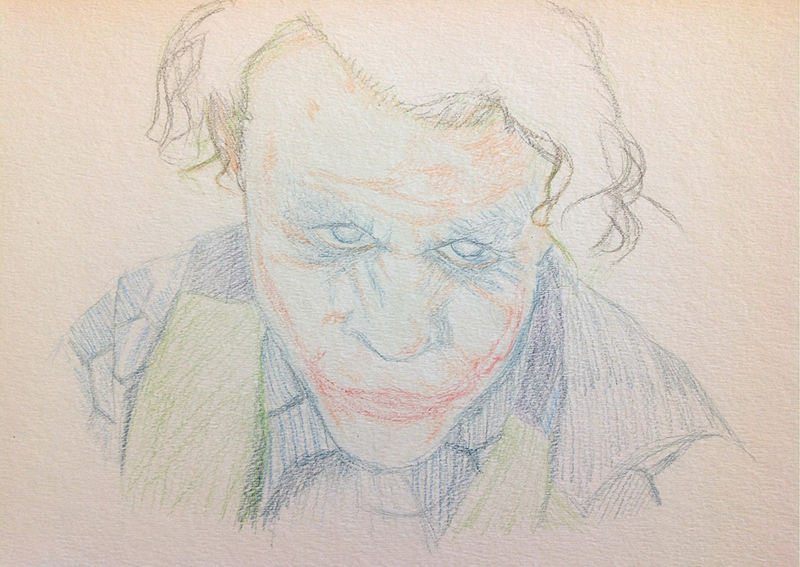 Painting the Joker • .]MD[. After getting my feet wet with some practice paintings, I decided to take on a more complicated subject – the Joker. 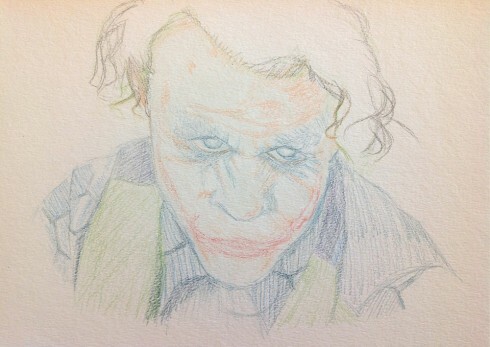 In this case, I chose Heath Ledger’s Joker from a photo on the internet. 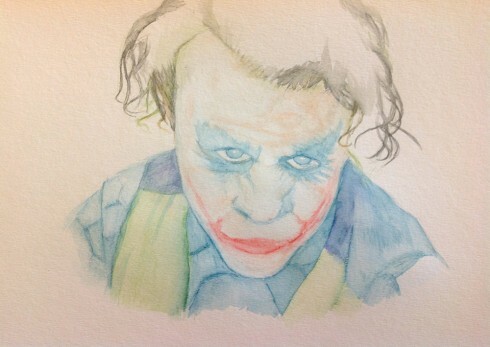 The image isn’t an exact likeness, but I think it captures most of the essence of Heath’s Joker. My next watercolor will be more exact as I fine tune my technique though. Please enjoy this short step by step of how I created the final image below. 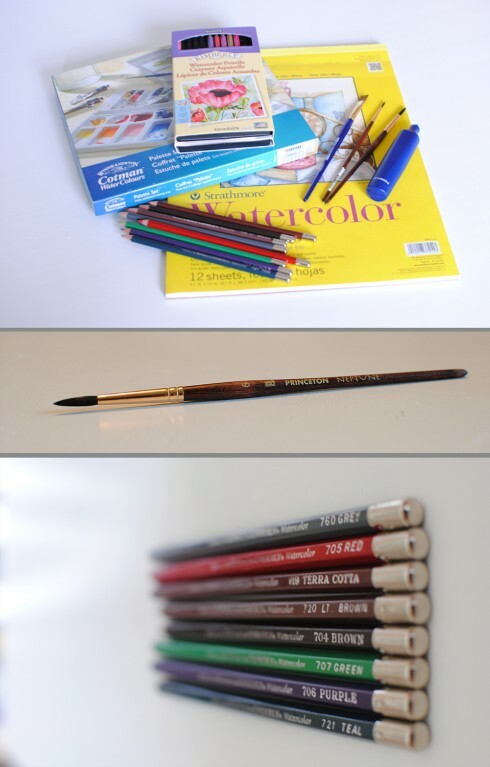 Step 1 – I laid down subtle lines of color using watercolor pencils. A very light touch was used here, and it doesn’t look like much at this point. The most critical parts to get right were Heath’s eyes, nose, and mouth. If I were to paint only these areas of his face, they would still capture the essense of Heath’s Joker I think. Unfortunately, I started to large. As a result, the hair was clipped at the top of the paper. While the original still image from the movie clips the top of his head, I could easily have fudged that part.  No black was used. I prefer never to use black. I didn’t even mix any colors here. Just used the pencils as is, without wetting them. Step 2 – Once I finished with the first pencil sketch, I used the #2 and #6 brushes to begin to add water, delicately turning the rough pencil sketch lines into solid areas of paint. 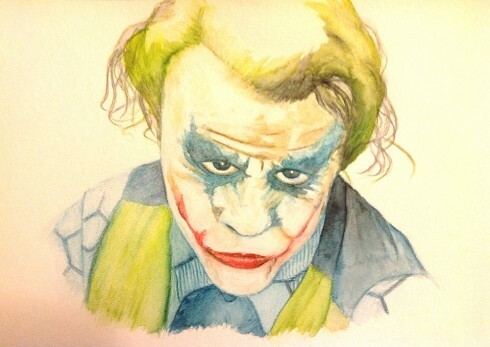 The Joker’s face paint almost works itself out with watercolors. No new colors or paint added at this point. I’m really just brushing the color around that I laid down with the pencils. I actually used a white watercolor pencil for the white face paint, rather than leave it as blank canvas. Step 3 – I repeat step 2 several times, gently adding more color as I go. You can see how the color begins to build up and darken as each layer dries and I add another layer. I did this over a period of several days, taking my time with it. Sometimes, I leave pencil marks as they are, without adding water to give the final image a more illustrative feel.At this point, I’ve begun to use actual watercolor paint from a tube. Green and dark blue are mixed to add shadows. I decided to go ahead and use a little black around the eyes and a tad in the hair, though I think I used a little too much in the hair. 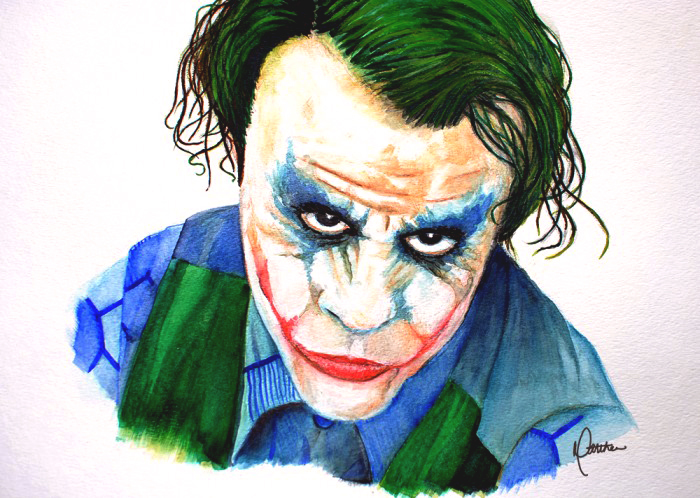 Most of the time, the paint was used with very little water to create more opaque strokes.The hair isn’t a messy as Heath Ledger’s hair from the movie, but more stylized and much greener. I also painted too much blue above the left eye (you can see it below on the right side of the image). I used my electric eraser to remove some of it in the final painting, as well as to clean paint away from areas of the face that I wanted to keep white.